The great quest of a little brave warrior! "It's a complete chaos!. Many of your bee brothers are missing. Somebody stole the hive's honey reserves. The swarm is starving because of the nectar shortage... These are hard days for the bees, and the Bee Queen has chosen you to uncover those misteries..."
Use your mouse to move the bee, and left click to sting your enemies. Further instructions at the tutorial level. More than 1 hour of gameplay in "Normal" mode, even more in "Hard" mode, and an endless "Survival" level. -Play the 30 levels of the story. 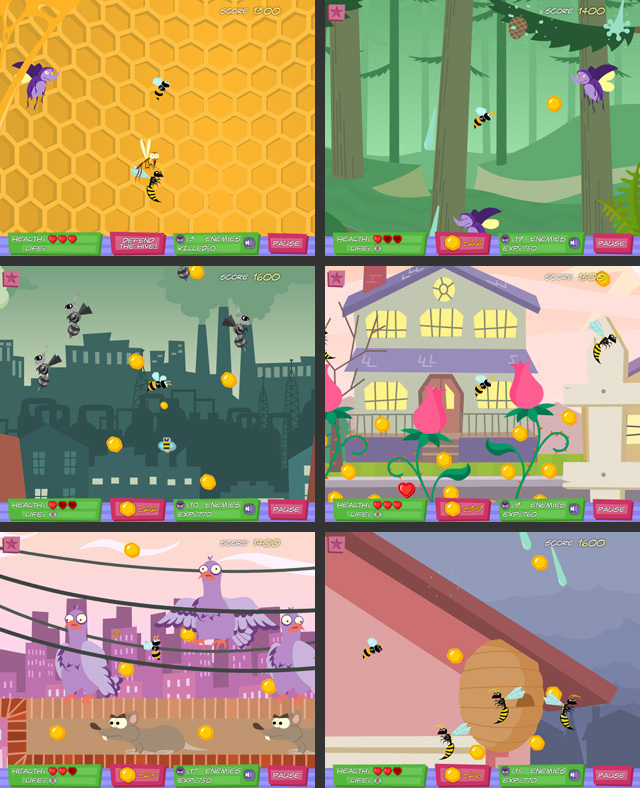 -Get rid of the bee's enemies, from beetles and mosquitoes to pigeons and robots! -Upgrade your Attack, Speed, Boost and Health, at the hive store. -Beat the 5 Big Bad Bosses. -Test your skills in the survival level to increase your overall score. -Fight against nature, in the windy and rainy levels. -Kill all enemies and find hidden bonus to get the perfect badge of every level. -Explore the fields, the tunnels, the forest, the backyards, the kitchens, the sewers, the supermarket, and all scenarios in the 5 worlds of Honey Hunter.